TECHNOVA Co.,Ltd. 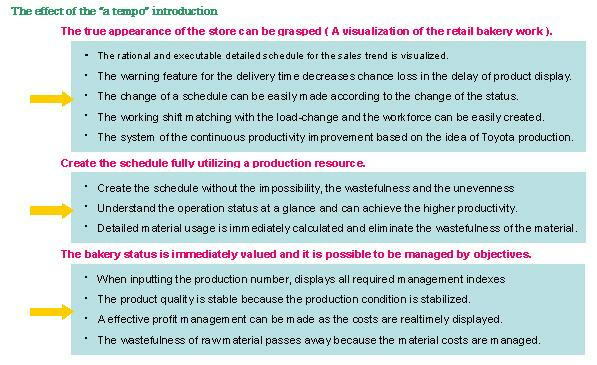 Retail Bakery Making Profit Software　"@ tempo"
In the daily changing sales environment, a retail bakery is managed on the embrasure of the risk of the losing sales chance and the overproduction. Product isn't sold if it is not produced timely for the sales peak, different from the mass production factory. Of course, freshness is lost if making too early and the customer is leaving. The production schedule meeting in the change of the sales volume for every hour becomes the key of the retail bakery prosperity. However, this opts to become a production schedule with low labor efficiency. So far, as for the profitability of the retail bakery, which has been upon the store manager’s skill. be received once. The three persons per one company can participate at the same time. These prices above are for customer in Japan. above condition ( Software change is not applicable). 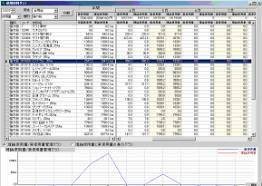 * In the case of introduction of the server client method, MES ( Manufacturing Execution System ) building, is available. In the chain stores, separately, it supports a central control in the head-quarter by the LAN connection, too. (Ask separately for the quotation). Q: What thing is made by “at tempo”? A: It is the visualization of the bakery if saying by a word. The one day of the bakery is easily shown in the graph. There are a lot of things to be able to do. The following are the some of them. １．Production plan/Process control:　Baking-up plan �@ adjusting to the sales peak can be easily created. Alarm-display�A is on for the behind schedule ( delivery ). A required work force displayed by every minute makes it possible to arrange of the worker efficiently. According to the sales, the change of plan�B such as the addition of the product is easily made. 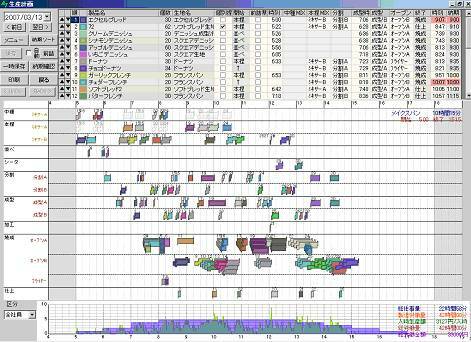 The production by correct condition�C and the stable quality can be done because planned time is shown every process. The cost reduction�D can be executed as a results of efficient production. ２．Raw Material Control:　It calculates material consumption�E and eliminates the wastefulness of material. It has a feature of the inventory check�F, too. 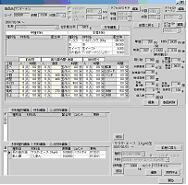 It prevents material ordering forgetting�G. The consumption of all the material�H such as the filling and own made material can be compared with the actual consumption. 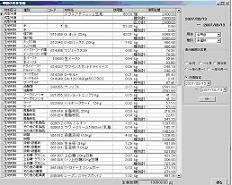 The planned material ordering�I is made. The raw material price can be confirmed�J at any time. ３. Product Control: The quality of the product is stable because the process condition of all products is stipulated and can be controlled with manufacture rule�K. It calculates the labor cost�M in addition to the material cost�L. ４．Making Working Shift:　Working shift plan�N can be easily created at the bakery with many part-time jobs. ５．Optimization of Work and Labor:　A working condition and the status of working shift are evaluated�O. ６．Simulation:　The future production, the special order, the plan and the remodeling of new shop and so on can be reviewed beforehand. By the tentative saving mode�P the plan is studied in the comparison. ８．Management Indexes:　Many indexes are calculated in the real time (Daily report is created�R). ９．Traceability support �S:　A product list about products which the specific raw material is used is shown. Q: Is there a meaning in the name of “ a tempo” ? A:　“@ tempo” , it is a meaning " at store ". The “a tempo” is a meaning, " by the tempo ", in the music term.It is named with the wish to manage a bakery skillfully at the tempo suited rhythm at tempo ( a retail store ). Q:　Where is different about “at tempo” and “Ad libitum” ? A:　“Ad libitum” is the large-scale software for the mass production factory being made according to the specification of each factory. The price is above the millions yen. Because it is different every factory, it is customarily made according to the condition of the mass production factory. However, it was expensive for the small retail bakery. The “at tempo” has been created for the small retail bakery after investigation of small retail bakeries. The “at tempo” has a very high performance regardless of the price. The “a tempo” is a package software for the retail bakery and is not customized for each retail bakery. However, because customization in case of practical use is made by entering the condition of the bakery, it is possible to use at most retail bakery. Moreover, a professional operator isn't needed. Q:　At what bakery, is it possible to use “ at tempo” ? A:　Refer to the introduction object in the back. It is possible to use at most retail bakery. Q:　Will it be difficult to use? Is it possible to use other than the master of the PC ? A：　Every one who can use Word and Excel can easily use it. A detailed instruction manual is installed in the PC. A：　Be relieved because we are doing the 1DAY seminar separately. A support contract includes to make a question in many times in the e-mail, the telephone, at the fax. The 1DAY seminar, too, is included in the support contract. Q: Does it think of convenient if being, but isn't the daily maintenance terrible? A:　Only required maintenance operation other than the daily use are new material registration, change material cost, the new product subscription and new employee registration, etc., it is not required so much time. Q：　It is anxious for whether the performance will be poor in future when buying early. A：　Buying a support contract, it is possible to buy in the favorable condition the new version. Q: What PC is it possible used ? A：　It is so-called ordinary PC. Refer to the necessary system environment in the back for the specification. Q：　Is there any thing to prepare as well as the PC ? A：　There is no thing to be prepared specifically. 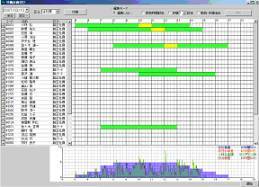 Of course, the data of the information to input in the “at tempo” such as the product standards, the staff and the equipment and so on, is necessary.